McLurg’s Law | Be Responsible – Be Free! I wasn’t planning to comment on the Japanese earthquake, as it’s being fully covered elsewhere. But last night’s hysterical treatment of the relatively minor damage at the Fukushima Daiichi nuclear power plant on the local current affairs TV program Four Corners made me reconsider. 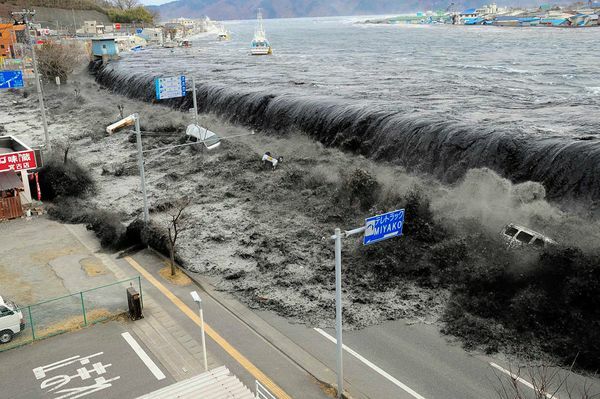 According to the latest reports, the death toll from the earthquake and subsequent tsunami is set to exceed 22,000. Twenty-two thousand! Most of these deaths occurred in a relatively small number of administrative districts (prefectures); entire coastal communities have been literally wiped out. The scale of the human tragedy in this most westernized of Eastern nations beggars belief. And yet: what are the mainstream media tearing themselves apart over? Three Mile Island. Chernobyl. Total casualties this time round: zero. Total power plant workers receiving even moderate radiation doses: one—maybe. You would have to be more than a little blind not to sense an agenda at work. McLurg’s Law is attributed to a long-dead British news editor, who blithely used the death toll of a disaster to quantify its newsworthiness, as being inversely proportional to its distance from London. Australian journalist, barrister and media commentator Stuart Littlemore, in his autobiography The Media and Me recalled the Australian version of McLurg’s Law as 10,000 killed in a Peruvian earthquake equals 100 killed in an Irish railway accident, 10 killed in an Australian state capital city apart from your own, and one person killed in the suburb in which you live. I’d suggest you could replace geographic proximity with the degree to which the cause of deaths dovetails with your own prejudices. How about, twenty thousand killed in a natural disaster equals two people killed climbing an ice cliff (which may or not have been on a melting glacier), equals forty-four people killed by wind farms (if you’re a journo who likes them) equals one parrot killed by a wind farm (if you’re a journo whose back yard is slated for windmill construction). Equals one hundred million murdered by socialist dictatorships in the twentieth century. I could go on. But I’m sure you can do better. This entry was posted in AGW, Libertarianism. Bookmark the permalink. Oz we had a sort of morbid fascination with death toll numbers at college we judged a major geologic event by it’s death toll. Far from the carnage we could not appreciate the suffering. However it has given me an appreciation of when it is time to get the heck out of Dodge. During the Indonesian Tsunami as the casualty figures came in quite low initially I warned my in laws this was going to be really bad I was right. However my favourite death sequence of all time was the death of two French vulcanologists captured on film trying to outrun a Nuee Ardente. This husband and wife had had a death wish for some time in their search for knowledge dodging volcanic bombs in heat resistant suits for the next best picture. Which beats my college professors meeting with the local Don in Sicily a mandatory meal to tell him just what the heck he was doing on his volcano, fortunately the Don was an educated man and granted him free license to roam where he would. The Aberdeen “Press & Journal” newspaper is credited with running the headline “Aberdeen man missing, feared drowned”, then lower down the page as a small header in other news: “Titanic sinks”.